Second Day. In the early morning, the mountain peak had just revealed its blurry outline from the black of the night. Su Yi in his room stopped his breathing. He deformed his hand seal. As a misty breath slipped out of his throat, he opened his eyes. There was a shining light in his eyes, so bright that it burns and was then immediately kept back into the body. Feeling the abundant Yuan Qi in his Qi Ocean, Su Yi was elated. Under the conditions when he was not in that mysterious room but just cultivating normally, the Yuan Qi in his body seemed to also increase at quite a speed. In just one short night, Su Yi could feel the obvious change in the amount of Yuan Qi in his Qi Ocean. It was a lot fuller than yesterday. Credit where credit’s due. Su Yi knew that all this could only happen because of the “Supreme Chaotic Yuan Technique”. He had not guessed wrongly. This technique which he had gotten from inside that mysterious space was definitely not normal. Stretching his stiff waist, Su Yi leaped down from his bed. Today was the day that people from Sacred Mountain came to conduct the selection test. He had to get ready. Outside his room, Wan Er’s voice had already traveled in. She knew Su Yi’s habit. He liked to bath in the morning, so she had prepared fresh clothes for changing. He took a bath, tidied up his hair and then donned on a blue robe which he loved. The black engravings on the sleeves shook slightly. His eyes were full of determination. Looking at himself in the copper mirror, Su Yi examined himself left and right. The more he looked, the more he was satisfied. If this was his previous life, he could definitely make a living just by using his looks. “Big Brother, I have gotten some breakfast for you from the kitchen. Come and eat some. Guard Leader Su Bai Han is still outside the main door waiting. It is time to go and participate in the selection test,” Wan Er entered the room and said. The Su Family’s breakfast was always just average. Su Yi really missed the assortment of food he was able to eat in his previous life. Also, unsure whether it is because of entering the Yuan Soul Realm, after the cultivation last night, he felt extremely refreshed, not even feeling a hint of hunger. Su Wan Er looked at Su Yi. She wanted to go on but stopped. The matter of Liu Ruoxi entering Sacred Mountain a long time ago, Wan Er had always heard about it and even knew that Liu Ruoxi’s position at Sacred Mountain was not normal as well. Furthermore, with Ruoxi’s temper, she was afraid that when Su Yi reached Sacred Mountain, he would be abused. “Do you also think that I am not worthy of that little girl?” Su Yi rolled his eyes at Wan Er. Su Yi grinned, his smile was a bit evil. That little girl was only 12 years old three years ago, but she was already a beauty. Now she would be even more outstanding, a beauty among beauties. Suddenly, Su Yi scolded himself in his heart. That little girl was after all, well, a little girl, while he had already reincarnated. He was actually thinking of that little girl. He really was shameless. Su Wan Er was very clear that Su Yi had not gotten the short end of the stick since young. Only when he was in front of Liu Ruoxi, he would always suffer a loss. Quite a few times had he also been beaten up. “You are still a little girl. What do you know?” Su Yi poked Wan Er’s forehead and left the room. Outside the main door, the members of the Su Family were already waiting with beasts as their mounts. They stood in line and emanated a fierce presence. Su Bai Han was standing outside the main door. When he saw Su Yi, he walked to his front. “Uncle Han,” Su Yi nodded his head. What happened yesterday to the guards, he had already felt it yesterday. Hearing how Su Yi greeted him, the looks in Su Bai Han’s eyes changed but his face did not. Today was particularly special. It was the first time Sacred Mountain had sent their strong to come and choose disciples from the City of Man. This had caused the city to be livelier than usual for the past few days. Even if one knew that their talent was not enough, no one wished to miss this grand occasion. The City of Man was in a desolate place. Most people never left the city but the name “Sacred Mountain” was like thunder in one’s ears. Sacred Mountain. That was a sacred place for cultivators. It was said that any disciple from Sacred Mountain was enough to cause an upheaval in any place. If one wanted to enter Sacred Mountain, he must first pass the talent examination test. Today’s test would be held on the wide stage in the heart of the city. Since early morning, people had already flooded the area around the stage. The people walked to and fro. It was lively and boisterous more than ever before. Surrounding the stage, there were already guards from the He, Su, Mo, Song, and Liao, the five big families, to maintain order. There were even beast riders outside. Their aggressive presence shook the hearts of people. In the center of the stage, there was a large tower built, exuding an awe-inspiring presence. For the sake of receiving the people from Sacred Mountain, everything must be done to perfection. The enthusiastic voices of the boisterous crowd converged into a wave and pierced through the clouds. Following the arrival of each large family, the crowd started moving. When He San, Song Wu Qiu, Mo Bu Fan, these influential people appeared, it mesmerized the hearts of some young ladies. The young ladies who were bolder even squealed out sharply. In this world, the position of martial artists was already very high. 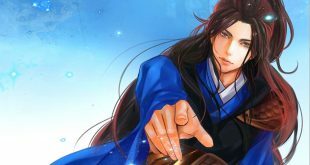 Not to mention, He San, Song Wu Qiu, this group of famous Young Masters in the city was destined to be in charge of their families in the future, this fact made the hearts of the young ladies flutter even more. As Su Yi followed the other members of the Su Family, riding a beast of the Su Family to the stage, he could feel the liveliness of the crowd. People flooded the streets and the sounds of chatter surged through the clouds. Three years in the Forest of Demons and being reincarnated in this world had already caused Su Yi to be far calmer than people of his age. But under the influence of this atmosphere, Su Yi’s heart could not resist beating slightly faster than usual.